Please select an option Small Med Large X-large 2x-large 3x-large 4x - large 5x- large Please select a Size. When the temperatures rise, wear the Chill With Me Chiffon Shirt for a comfortable look that feels great. It's office appropriate, and you'll love to lounge in it at home too! We've all tried to make style statements and made mistakes in mixing trends and textures, patterns and colors. This top's solid color and relaxed silhouette give you a classic, versatile look no matter the occasion. Wear this shirt to give positive and comfortable vibe that says "Chill With Me." 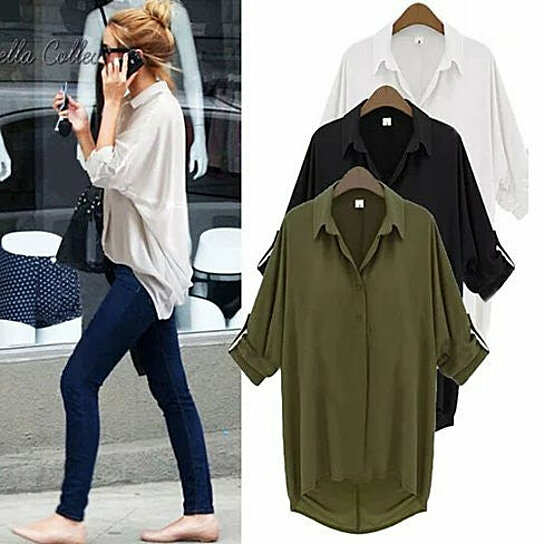 Made of 100% soft chiffon with relaxed shirt collar. Small - Bust: 26" / Hips 22" /Sleeve: 24" / hi low Length: 22"-29". Medium - Bust: 27" / Hips 22"/ Sleeve: 25" / hi low Length: 23"-30". Large - Bust: 28" / Hips 24"/ Sleeve: 26" / hi low Length:24"-31". X-Large - Bust: 29" / Hips 26"/ Sleeve: 26" / hi low Length:25"-32". 2 X-Large - Bust: 30" / Hips 26"/ Sleeve: 26" / hi low Length: 26"-33". 3 X-Large - Bust: 31" / Hips 26"/ Sleeve: 26" / hi low Length: 26"-33". 4 X-Large- Bust: 33" / Hips 26"/ Sleeve: 26" / hi low Length: 27"-34". 5 X-Large Bust: 33" / Hips 27"/ Sleeve: 27" / hi low Length: 28"-35". 3 buttons in front and rolled up tabs on sleeves. Machine wash in gentle cycle and cold water or hand wash / Dry cleaning recommended. It comes in basic neutral colors like OLIVE, BLACK AND WHITE.